The University of Illinois at Chicago is her top choice where she has received a full ride, including room & board, Honors Presidential Award Program scholarship. She plans on pursuing a major in Psychology with a minor in Linguistics. She was also accepted to Dominican University, University of Minnesota at Morris, University of Minnesota at Twin Cities Campus, University of Minnesota at Duluth, the College of DuPage and the University of Rochester with varying levels of scholarships and other financial assistance. In her four years at IC Catholic Prep, Amber participated in numerous extracurricular activities, including leadership roles as the Newspaper Editor for the Knight Times school newspaper and Fundraising Officer of the drama club. She was active on the Math Team, Bowling Team, WYSE Team, and the Ecology Club. Amber was recognized as an Illinois State Scholar and received the Salute to Academic Achievement for her academic achievements. Her ultimate career goal is “to open a resource center (mental, academic, etc.) for teens who don’t have access to certain development tools.” She continued to say that she hopes to be a productive citizen who contribute to the larger good of society. She came to ICCP from Divine Providence. Elmhurst — April 10, 2019 — IC Catholic Prep (ICCP) announced the eight seniors from the Class of 2019 that have earned the school’s most prestigious and highest academic award possible, the Monsignor Plunkett Distinguished Scholar. Named after the founder of Immaculate Conception High School, the award is given to honor the outstanding achievements of the top Senior scholars (as determined by the grade point average and academic course load) for their commitment to academic excellence. A “Believe in Hard Work” (#BelieveinHardWork) student spotlight will profile each awardee in the upcoming weeks preceeding the Graduation Ceremony. Follow the conversation on Facebook, Instagram and Twitter. On Thursday, March 21, 2019, IC Catholic Prep (ICCP) hosted the biennial Wall of Honor Award presentation at the Immaculate Conception Parish Sacred Heart Chapel. This year we honored Dr. Don Hoffman with the ICCP Wall of Honor Award for his commitment to Catholic education and the IC Catholic Prep school community. The Very Rev. Thomas Paul presided over the Mass to venerate Mr. Hoffman as he was joined by his family, friends and the entire ICCP student body and faculty to celebrate the special occasion. 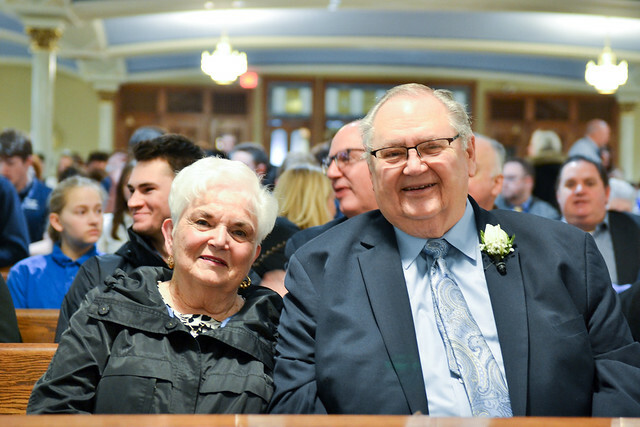 Dr. Hoffman continues to touch the lives of many people and the Wall of Honor Award presentation was a day of celebration in his honor as part of the ICCP family, and the proud traditions established by Monsignor Plunkett and the Sisters of St. Agnes. Dr. Hoffman’s involvement at IC Catholic Prep could fill hundreds of pages in a history book. In addition to his lifelong support of Catholic education, he has been a former parent, Board Member, and dedicated friend to ICCP. Through the years, he has partnered with ICCP and trusted the staff and faculty with the faith formation of his children and grandchildren. He was nominated by his family for the ICCP Wall of Honor Award, because of his unwavering support of Catholic Education and our community. Dr. Hoffman and his wife Mary, have modeled a faith-filled and loving marriage for 52 years. They have raised eight children and have 11 grandchildren. Dr. Hoffman was a trusted Pediatrician for multiple generations of parents, who were privileged to receive his guidance and care for their children. It is their faith that remained strong as he and Mary sacrificed to send all eight of their children through Visitation Catholic Grade School and IC Catholic Prep in order to support and nurture their children’s faith journey. The Wall of Honor Award is presented every other year, in order to recognize those who epitomize the ICCP spirit. This award is designed to celebrate past or present faculty members, staff members, past parents, grandparents, community members, or supporters of IC Catholic Prep who have shown dedication, love, support, and enthusiasm for Catholic education and our school. It is because of this dedication, love, and support of the IC Catholic Prep and Elmhurst Communities, that Dr. Hoffman was presented the ICCP Wall of Honor Award. Dr. Hoffman closed his remarks with an emotional testimony about how it pleases him to no end that he has done something with his life that is positive — for which he was given a two-minute standing ovation. Suggestions or recommendations for future Wall of Honor recipients can be submitted to Tracie Ortman at 630-530-3491 or [email protected]. The 2018 Global Power 150 — Women in Staffing list is now online. This is a list of 150 most influential women in North America, Europe and around the globe. This is the fourth year that Staffing Industry Analysts has produced a Women in Staffing list. This year’s list includes 100 influential women in the Americas — twice as many as past lists — and 50 more from around the world. The women are also featured in the November/December print edition of Staffing Industry Review magazine. Maureen (Brown ’98) Hoersten is chief operating officer for LaSalle Network, a national staffing, recruiting and culture firm, where she is responsible for driving and managing new and existing business as well as overseeing recruiting functions. She has been recognized as one of Chicago Business Journal’s “Women of Influence,” and has been featured by CNBC, Fast Company and the Chicago Tribune on recruiting and retaining top talent. Through her leadership efforts, LaSalle has been honored with more than 100 culture and revenue-based awards, including the Inc. 5000 list for 11 consecutive years and Glassdoor’s “Best Places to Work” list. The list is sponsored by Bullhorn. Read about the 2018 Global Power 150 — Women in Staffing online here. Voter registration and early voting have surged nationally in preparation for the upcoming midterm elections, and one North Central student has led the charge to promote voter participation among students on campus. Assistant Professor of Political Science Alyx D. Mark approached Josh Simmons ’20 about participating in the Campus Election Engagement Project. With Mark’s help, the Project chose Simmons for one of their six fellowships across Illinois. They provided him with a $1,000 grant to help him work on raising awareness and registering students to vote. Simmons set up tables in common gathering places on campus like the Old Main lawn and the Harold and Eva White Activities Center. He was there with information and displays on the importance of voting and provided incentives to register, such as giving out stickers and posting photos of voters with signs saying why they believe their vote matters. This is just the beginning of a lifelong mission to inspire change and activism for Simmons. “My ultimate career goal is to do work similar to what I have done during my fellowship,” Simmons said. “I want to dedicate my life to social justice and civic engagement initiatives, specifically working to alleviate problems within the criminal justice system. Learn more about being an active member of the League of Knights, our alumni association. Thank you for supporting the student athletes at ICCP. We will post weekly winners, on this page, on or about Wednesday of each week. Contact, Tim Butterly, NFL Raffle Chairman for more information about the raffle. He can be reached at [email protected] or 847.220.0022. Thank you once again for your continued support of the program. Thank you for supporting the student athletes at ICCP. With the NFL season underway, we will post weekly winners, on this page, on or about Wednesday of each week. Ticket(s) last all season (each NFL week = a chance to win). Winning combinations will be updated each week on the ICCP Parent Portal. Tickets need to be bought/sold by September 11 at 3 p.m. to be included in the Week 1 Winners. Trisha Cassidy is known for her role in improving healthcare for the vast number of communities that AMITA Health serves, particularly for the underserved. She’s led the strategic growth of AMITA Health from the Alexian Brothers-Adventist Midwest Health joint venture to the ongoing outpatient facility construction in suburban Chicago. She’s now spearheading the integration of Presence Health, which AMITA acquired earlier this year, and which enlarges its market share to cover the entire metropolitan Chicago area as far south as Kankakee. Previously, she oversaw the development of the AMITA Health Care Network, which allows more than 1,700 physicians to take value-based contracts. She’s also responsible for the AMITA Health Medicare Accountable Care Organization, which in 2017 achieved the fourth highest quality score in the nation. Away from work, she mentors a master’s student at UIC, and holds an appointment in the Loyola University Chicago Stritch School of Medicine Neiswanger Institute of Bioethics, where she co-directs a healthcare leadership course. She’s active in many professional organizations and last year was named one of the top healthcare strategists in the United States by Becker’s Hospital Review. This special advertising section is produced by Crain’s Custom Media, the marketing storytelling arm of Crain’s Chicago Business. The Crain’s Chicago Business newsroom is not involved in creating Crain’s Custom Media content.